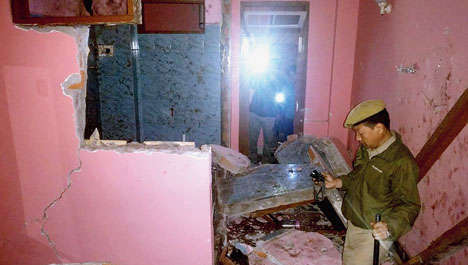 Gangtok: A geyser in a bathroom of a hotel here exploded on early Sunday morning, knocking down the wall that separates the adjacent room and injuring four tourists from Maharashtra who were fast asleep. The authorities have sealed Hotel Sonam at Lal Bazar after the blast that, according to a preliminary analysis, was caused by overheating of the geyser. The incident occurred about 2.30am when the four tourists - three men and a girl - were sleeping in the room. While three received minor injuries, the fourth tourist fractured one of his legs. Bikash Tiwari, the station house officer of Gangtok Sadar, said a case had been registered against the person who was running the hotel on lease. He has been charged with negligent conduct with respect to machinery and endangering the life and personal safety of others. "The hotel has been sealed for now. A team comprising forensic, fire and power experts will inspect the hotel tomorrow (Monday) to carry out a detailed investigation," he said. The injured persons were part of a group of about 35 tourists from Nagpur in Maharashtra and were scheduled to leave Sikkim in the next couple of days. The person who fractured the leg was identified as Hiralal, 64, a retired police officer. The other injured are Mahendra Nankar, 42, Majur Silal Deshmukh, 24, and Shivani Vinayak, 15. The police suspect Hiralal had fractured his leg either after being hit by flying debris of the wall that was shattered in the blast or from a fall while fleeing the room following the explosion. Management of hotels said many guests did not heed the advice to switch off the geyser once water was heated, and leave them on for hours together. "It barely takes 15 minutes to heat water in most geysers nowadays, but some guests are known to heat water for hours," said a hotel manager. A geyser in a bathroom of a hotel here exploded on early Sunday morning, knocking down the wall that separates the adjacent room and injuring four tourists from Maharashtra who were fast asleep.